I went to girls camp a couple of week ago. One of the things I was in charge of was putting together a few easy crafts. 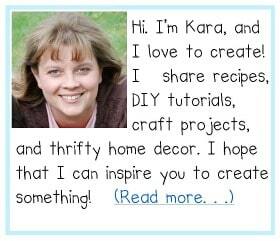 My friend Judy found a tutorial for pom pom pens at Sew Sara. I tried gathering them like Sarah did, but I had a hard time making them look good. 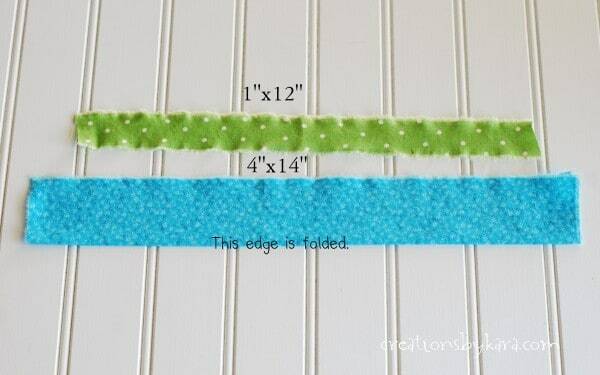 I decided to come up with an easier, no-sew method. I used green fabric on the bottom for my first one, and I thought it looked more like a flower than a pom pom. Flower pens were born. I made all my flower pens the same colors to match my craft room. 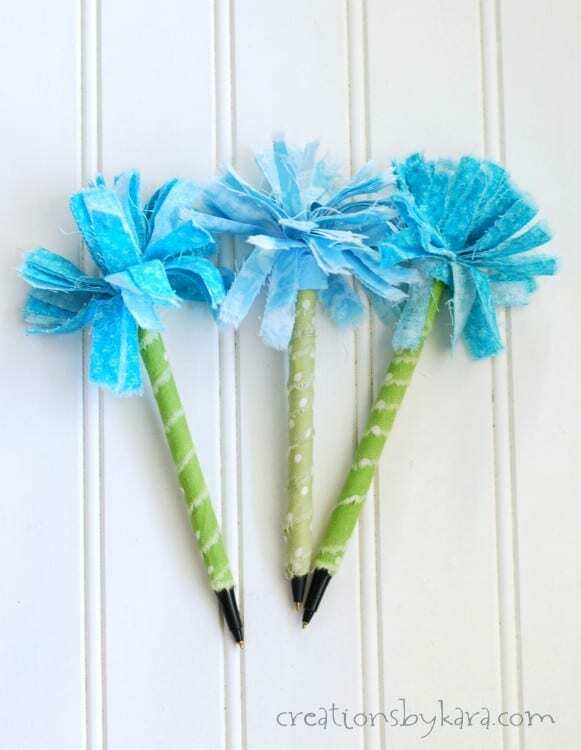 If you use different colors on the pens, they look like pom poms. 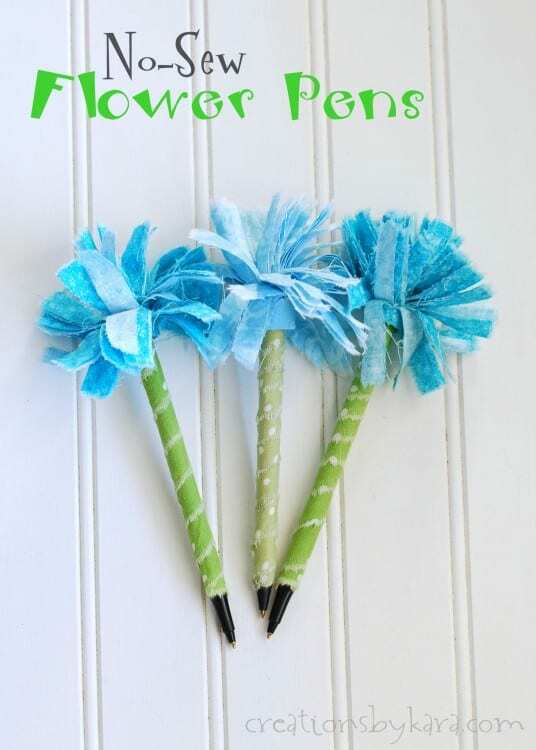 So call them flower pens, or call them pom pom pens, whatever floats your boat. 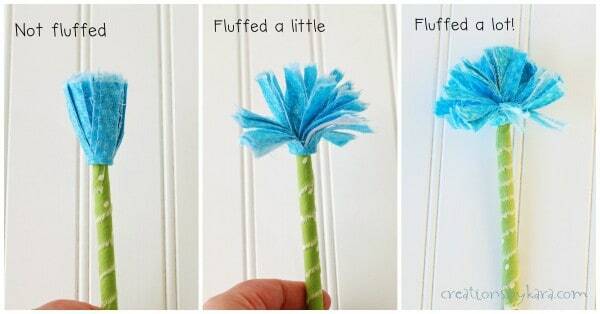 🙂 They are an easy craft that is perfect for older kids. You can cut the fabric, but I like to tear my pieces of fabric because I think it leaves a prettier edge. 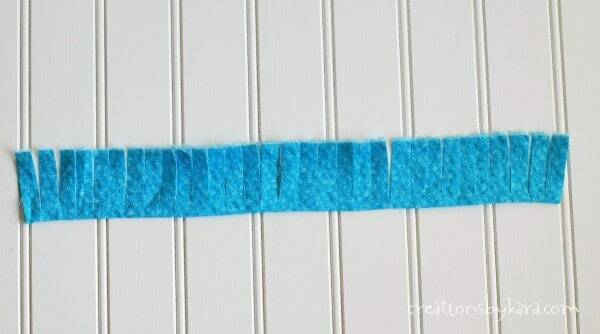 Just snip the edge of the fabric, then rip it the rest of the way. Fold the larger piece in half and iron it. Now you need to wrap your pen. I thought it worked the best to start at the bottom. 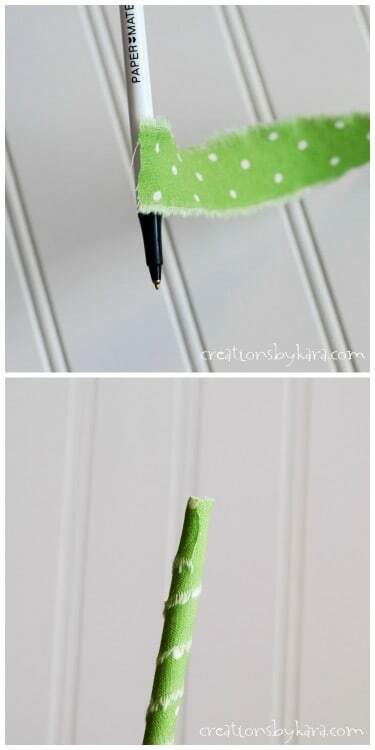 Use a small dab of hot glue to attach the 1″ strip to the pen. Then start wrapping it around the pen diagonally, attaching with hot glue every inch or so. When you get to the top, attach the end with hot glue and snip off any extra fabric. 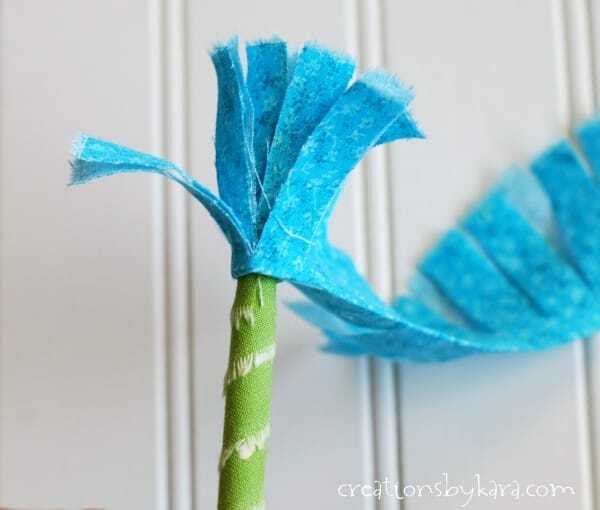 To make the flower for the top, cut slits about 1/4-1/2″ apart down the raw edge of the folded piece of fabric. Make sure you don’t cut all the way through to the fold! I cut a little too close for the one in this photo. I find it works best to stay 1/4 inch away from the fold. 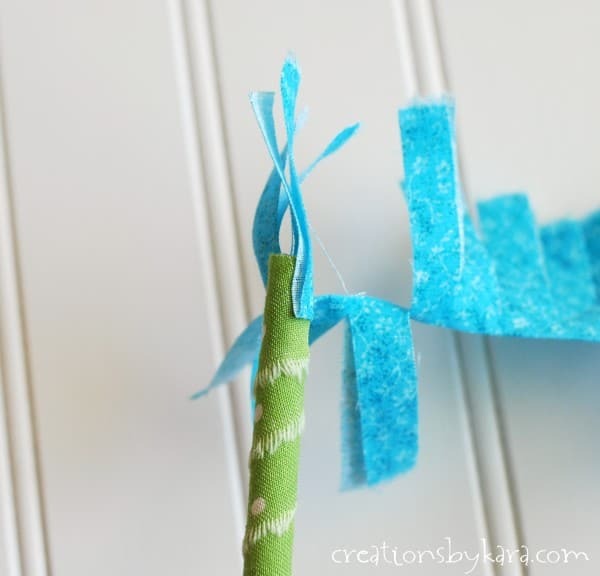 To make the fabric flower top, hot glue the bottom edge of your fabric onto the top of the pen, about 1/4-1/2″ down. Now just continue wrapping your cut fabric around the top, securing it with tiny dabs of hot glue as you go. When you get to the end, glue the edge down securely. Now it’s time to fluff it up. It will look pretty good after you just roll it between your hands and shake it, but for maximum fluffiness, pull the pieces of fabric apart two at a time. I think they look best really fluffed! Writing notes is much more fun when you use a cute flower pen, right? I would love to do this with my Girl Scouts at our next camping trip. Can you give me an estimate of how long it takes to make one pen? I have several girls and I think some may need help, so I’m trying to get an idea of how long this craft would take for planning purposes. Thank you! We made these tonight at our Young Women activity for our girls to take to camp. Thanks so much!!! Super cute and super easy!